April 1982 - Nicholas DeWitt, IU Professor of Economics, organized the Unity of Bloomington study group. The first meeting was held at the Fountain Park Community Center. February 1987 - The first Sunday Service was held in the auditorium of the Old Library, now the Monroe County Historical Society at 6th and Washington. Services were led by members of the spiritual family and a variety of guest speakers. June 1989 - Rev. David LeBeau, son of founding members Bob and Vivian LeBeau, became the first minister of Unity of Bloomington. August 1989 - The Unity Spiritual Growth Bookstore was established with the guidance of Bob LeBeau. October 1989 - Unity of Bloomington was officially incorporated as a church in the State of Indiana and became a full-fledged member of Unity Worldwide Ministries. September 1992 - Sunday services moved to rented space at the John Waldron Arts Center at 4th and Walnut. June 1997 - The growing community moved again to a location at 6th and Washington. February 1998 - Unity of Bloomington purchased a building at 14th and Dunn, serving as the eventual home of our chapel, offices, bookstore and lending library. January 2000 - Rev. Judith Ballard was inducted as the new minister and resigned after a brief tenure. 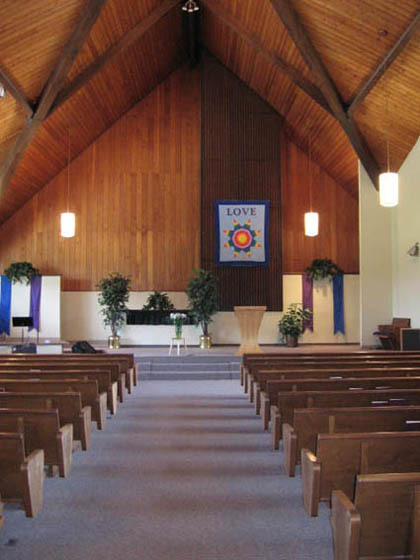 August 2000 - The Reverends David LeBeau, Lynnette Carlson, and Sam Windell began a cooperative ministry as Unity of Bloomington's spiritual leaders. August 2004 - Rev. Sam Windell made his transition. Rev. Lynnette and Rev. David continued to share the ministry leadership. October 2005 - Unity of Bloomington purchased the building at 4001 S. Rogers Street. February 2006 - Renovations were completed, and services began. January 2007 - Ginger Curry, who had been serving as Choir Director, joined the staff as Music Director. February 2010 - Rev. Lauri Boyd assumed spiritual leadership as full-time minister. April 2012 - Unity of Bloomington celebrated its 30th Anniversary as a spiritual community. March 2015 - Rev. Laurie Boyd resigned. DATE 2016 - Rev. Lynnette Carlson and Ginger Curry assumed the role of Spiritual Coordinators.